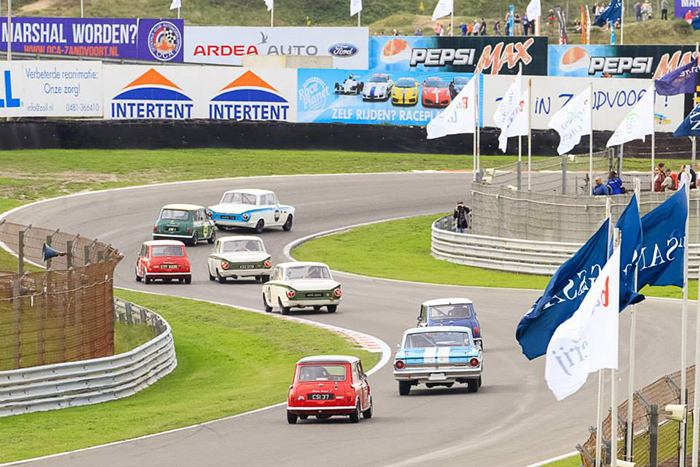 The Masters Historic Racing championship returned to Zandvoort with the Pre-66 Touring Cars, in which featured 6 Mini’s altogether all Swiftune powered. Qualifying saw the top 4 Mini’s of Jonathan Lewis, Adrian Barwick, Steve Jones and Rene De Vries covered by just 0.7 seconds. Jonathan Lewis finished in a brilliant 5th overall and 1st in class in a close Mini battle with Barwick in 2nd, and Rene De Vries in 3rd who battled for 8th overall. The Dutch NKGTTC race featured an incredible 58 cars including Ford Capri’s and Escorts, Porsche Carrera, a Lister Jaguar Knobbly and the Swiftune powered Longman 1275 GT Replica driven by Adrian Barwick. Out of 45 finishers in race 1, Adrian finished 1st in class and a brilliant 15th overall, and in race two driving duties was passed over to Jonathan Lewis who finished 1st in class and 12th overall. The popular Dutch NKHTGT championship concluded the weekend with Swiftune runners Rene De Vries and Burt Mets. The pairing finished 2nd and 3rd in class in race 1 and had a fantastic race 2 finishing 1st for De Vries and 3rd for Burt. Rene is now leading the championship with Burt in 2nd.